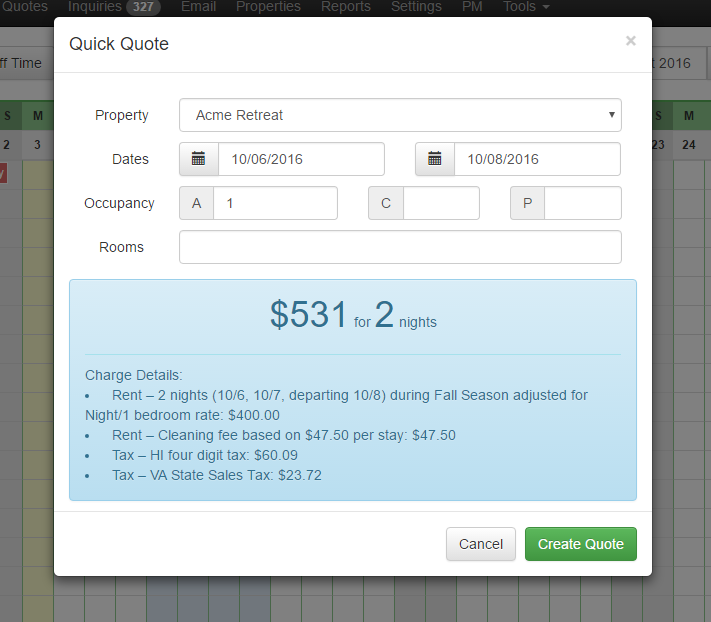 Create quotes (or check rates) quickly right from the ribbon! Hi everyone! As usual we've been designing and working on code a lot more than we've been sharing information or writing blog posts. We tend to do that! But I wanted to take a second to breathe and mention something pretty cool that we just put out there. The next time you look at your ribbon calendar, you'll notice that a little green button appears as you hover over the empty cells. Give that a little click, and bam - up pops a quick quote box with a bunch of stuff prefilled for you including the rates and any rules or warnings that might prevent the guest from booking. You can edit the quick quote and instantly see the rate and rules change. Just hit the ESC key on your keyboard to make the quick quote box disappear or X out of it. There's also a new Quick Quote button at the top if you want to open it from there. We're experimenting with making the ribbon and month views more dynamic. You'll notice that the property names on the right side of the ribbon view are clickable now as well. Our goal is to add a lot more functionality to these views to that you can quickly view what you want without having to click around so much. Hi Jeanna, It is not yet available on the guest side. We will announce that when it becomes available.